To complete your laminating system, LEDCO has designed the brand new High Speed "Finish Line" Cutter. This reasonably priced cutter has been designed to be used with either the HD-25 Workhorse laminator or any other 25 inch laminating system. Dependable. Easy to Use. Cost Effective. To complete your laminating system, LEDCO has designed the brand new High Speed "Finish Line" Cutter. This reasonably priced cutter has been designed to be used with either the HD-25 Workhorse laminator or any other laminating system. An integrated fiber optic sensor precisely activates the shearing blade as it senses the leading and trailing edges of each sheet to be cut. 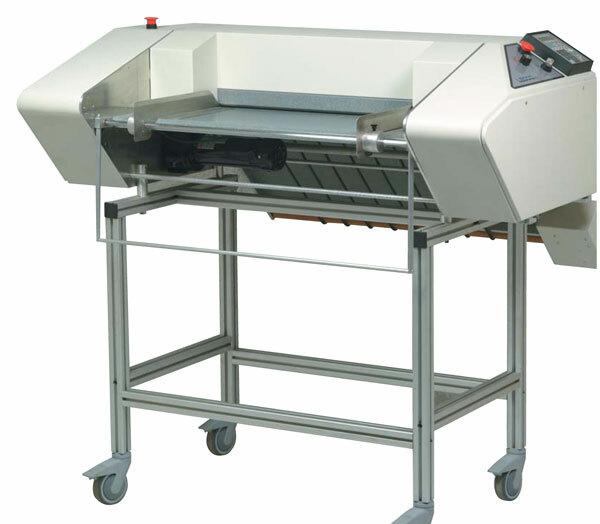 Speed is easily adjustable up to 150 FPM without stopping the machine during operation. The upper and lower cutter blades are interchangeable, making the cutter economical to operate. A feed table supports the web during the threading, and handy feed guides are conveniently adjusted from side to side to ensure precise web travel into the cutter. Unlike other competitive equipment, compressed air is not required. The easy-to-use keypad adds to the all over user friendliness of this cutter. A standard 115V, 15 amp outlet is all that is needed to begin operating this sleek, new, high-speed machine. Variable speed - The cutter operates at any speed up to 150 FPM (actual output may vary depending on number of cuts per minute). Levers to open and close feed rollers - The levers hold the rollers open while you thread and straighten the web. 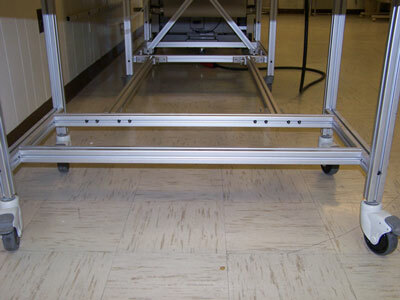 Feed table with adjustable guides - The feed table supports the web during threading and the guides are easily adjusted to ensure precise web travel. Total electrical operation - The unit is very convenient, only requiring a 115V 15 amp outlet or depending on model, 208V-240V single phase, 50/60 cycle, 13 amp outlet. Active mode variables displayed - The control panel displays all settings before, during and after operation. Speed adjustment during operation - The speed can be easily adjusted during operation. Interchangeable cutting blades - If the blades should ever become dull, they can be interchanged top to bottom for a new cutting edge. Stand - An extruded aluminum stand included with locking castors for fast and easy setup. I300001 Includes (2) pieces of extrusion, (4) brackets, fasteners, and the pins to hold it together.This option keeps the cutter and the laminator the right distance apart and also keeps them aligned with each other. The pins allow you to easily disconnect the cutter from the laminator. Dimensions 56" x 59" x 46"
Weight / Shipping Weight 320 lbs. / 640 lbs.